Exploit protection helps protect against malware that uses exploits to infect devices and spread. It consists of a number of mitigations that can be applied to either the operating system or individual apps. Many features from the Enhanced Mitigation Experience Toolkit (EMET) are included in exploit protection. You can also set mitigations to audit mode. Audit mode allows you to test how the mitigations would work (and review events) without impacting the normal use of the machine. They are configured by default in Windows 10. You can set each mitigation to on, off, or to its default value. Some mitigations have additional options. You can export these settings as an XML file and deploy them to other machines. Click the App & browser control tile (or the app icon on the left menu bar) and then click Exploit protection. Use Add by program name to have the mitigation applied to any running process with that name. You must specify a file with an extension. You can enter a full path to limit the mitigation to only the app with that name in that location. Use Choose exact file path to use a standard Windows Explorer file picker window to find and select the file you want. After selecting the app, you'll see a list of all the mitigations that can be applied. Choosing Audit will apply the mitigation in audit mode only. You will be notified if you need to restart the process or app, or if you need to restart Windows. Repeat this for all the apps and mitigations you want to configure. Repeat this for all the system-level mitigations you want to configure. Click Apply when you're done setting up your configuration. Mikael configures Data Execution Prevention (DEP) in the System settings section to be Off by default. Mikael then adds the app test.exe to the Program settings section. In the options for that app, under Data Execution Prevention (DEP), he enables the Override system settings option and sets the switch to On. There are no other apps listed in the Program settings section. The result will be that DEP only will be enabled for test.exe. All other apps will not have DEP applied. Josie configures Data Execution Prevention (DEP) in the System settings section to be Off by default. Josie then adds the app test.exe to the Program settings section. In the options for that app, under Data Execution Prevention (DEP), she enables the Override system settings option and sets the switch to On. Josie also adds the app miles.exe to the Program settings section and configures Control flow guard (CFG) to On. She doesn't enable the Override system settings option for DEP or any other mitigations for that app. The result will be that DEP will be enabled for test.exe. DEP will not be enabled for any other app, including miles.exe. CFG will be enabled for miles.exe. Repeat this for all the apps and mitigations you want to configure. Click Apply when you're done setting up your configuration. Click Configure > Windows Defender Exploit Guard > Exploit protection. 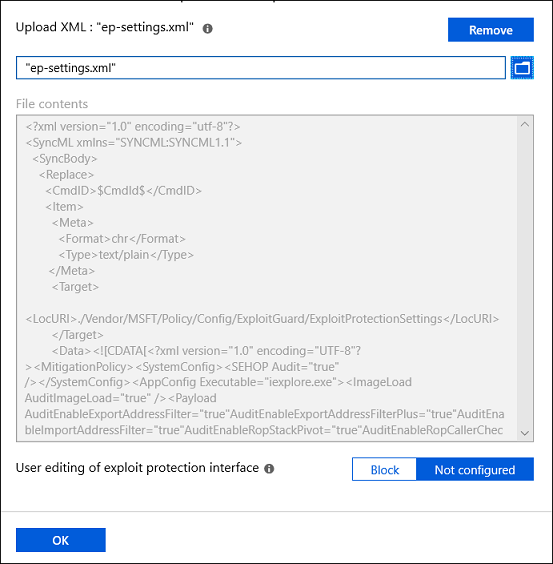 Use the ./Vendor/MSFT/Policy/Config/ExploitGuard/ExploitProtectionSettings configuration service provider (CSP) to enable or disable exploit protection mitigations or to use audit mode. 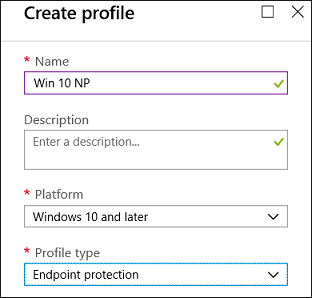 Expand the tree to Windows components > Windows Defender Exploit Guard > Exploit Protection > Use a common set of exploit protection settings. Click Enabled and type the location of the XML file and click OK.
System-level mitigations that have not been configured will show a status of NOTSET. For system-level settings, NOTSET indicates the default setting for that mitigation has been applied. For app-level settings, NOTSET indicates the system-level setting for the mitigation will be applied. The default setting for each system-level mitigation can be seen in the Windows Security. -Name to indicate the mitigations should be applied to a specific app. Specify the app's executable after this flag. The mitigation's cmdlet along with any suboptions (surrounded with spaces). Each mitigation is separated with a comma. Separate each mitigation option with commas. To disable mitigations, you can replace -Enable with -Disable. However, for app-level mitigations, this will force the mitigation to be disabled only for that app. This table lists the PowerShell cmdlets (and associated audit mode cmdlet) that can be used to configure each mitigation.